100% passionate speaker with a mission! “Realtionships capital is of priceless value. Having good relationships you live happier and achieve more! Good relationships are reachable for everyone! Good relationships creates strength and gives you good radiation. You create happiness and (work) pleasure. – “Golden workfundament”: How you through smarter networks that job and / or customer attracts that suits you. Ruud is a passionate speaker who knows how to touch people. His speeches are interactive and makes you an experience richer are, so you can really grow! Rudy Brouwer has over 25 years businessexperience. Brancheexperience: ICT, Telecom, HR, Government, Accountancy, Banking, Insurances, Education, Laywers, Entrepeneurs. As a keynote speaker i will give you an interactive experience! I will use no technics as powerpoint/prezi, etc. Just pure Rudy! job and/or client that suits you. You can find articles in managementmagazines,newspapers, live radio-and TV interviews. Exclusive: Our keynote is always unique as we interact with the audience. We use no technics like powerpoint/prezi, etc. I want to give you awareness and experience which you can apply directly in your daily live. 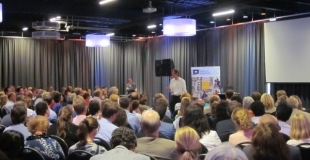 After you will leave the presentationroom you will have awareness (+question), a smile , new contacts, tips and results. 100 % guarantee of a passionate speaker with a mission! “Being yourself, gives ultimate freedom!